Examination of ash petioles in Ashwellthorpe Lower Wood in Norfolk on 2nd June 2013 revealed the presence of fungal fruiting bodies similar in appearance to those produced by Hymenoscyphus pseudoalbidus and Hymenoscyphus albidus (see Figure) the sexual forms of the pathogen known as Chalara fraxinea. 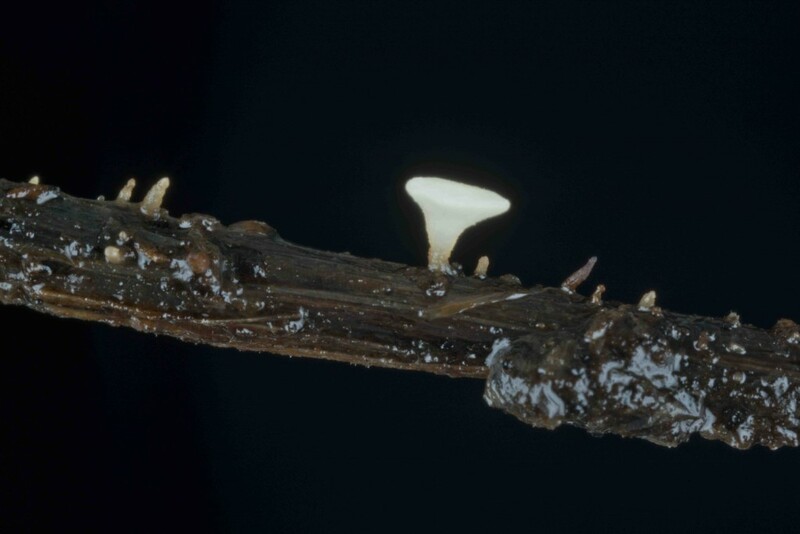 Two of the fruiting bodies were tested using DNA primers reported to be specific for these two fungi. The ITS region of 18S rDNA was amplified using universal primers: 5’-TCCGTAGGTGAACCTGCGG-3’ and 5’-TCCTCCGCTTATTGATATGC-3’ and Chalara specific primers 5’-AGCTGGGGAAACCTGACTG-3’ and 5’-ACACCGCAAGGACCCTATC-3’. DNA sequencing of the PCR-amplified products has confirmed that these fruiting bodies are produced by the ash pathogen H. pseudoalbidus. We believe this may be the first identification of spore-producing infections structures of the ash pathogen H. pseudoalbidus.in the UK and suggests that a new wave of infection has begun in the UK. It also fits with the identification of two mating types of the fungus in Norfolk. Picture by Andrew Davis (JIC).